Place the eggs in a small pan and cover with water. Bring to the boil and cook for 6 minutes. Drain and run the eggs under cold water until cool. Peel and then coarsely grate the eggs into a bowl. 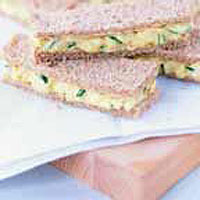 Mix with the salad cream, mayonnaise and chives and season. Cut off the bread crusts with a serrated knife. Butter the bread and divide the egg mixture between 4 bread slices. Top with the remaining bread. Stack 2 sandwiches together and cut into 3, then serve. Pierce the rounded end of each egg with a pin before cooking to help stop the shell from cracking. Cooling the eggs under cold water stops them from cooking further and prevents a dark ring forming around the yolk. For easy peeling, peel the eggs under cold running water over a colander to collect all the bits of shell. The water stops the shell from sticking to your fingers and the egg.